I thought about this subject long and hard, and what I decided was to try and combine the ‘differences’ that struck me about the theme. When I think about East, I think about warm, rich colours, silk, and shiny embellishments. When I think about West, I think about cool, delicate colours, cotton, straight lines and modest embellishments. Of course English paper piecing springs to my mind, because this is one of my favourite techniques. 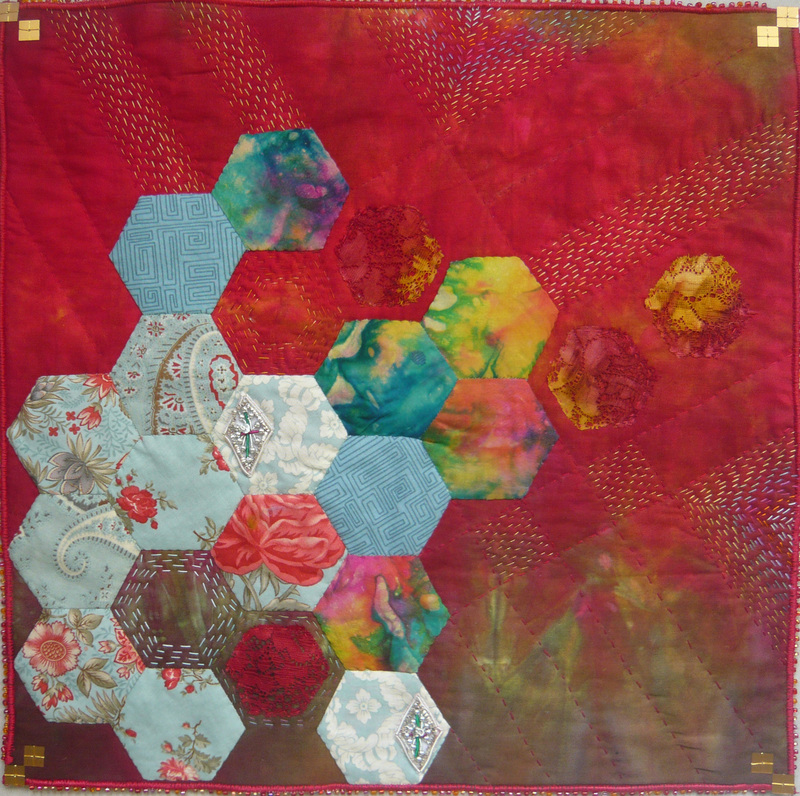 I used a rich red dyed cotton fabric for the background, and appliqued onto that a section of English pieced hexagons which used printed commercial fabrics and hand-dyed silk and lace. By doing this I was intending to mix the fabrics that remind me of both East and West. 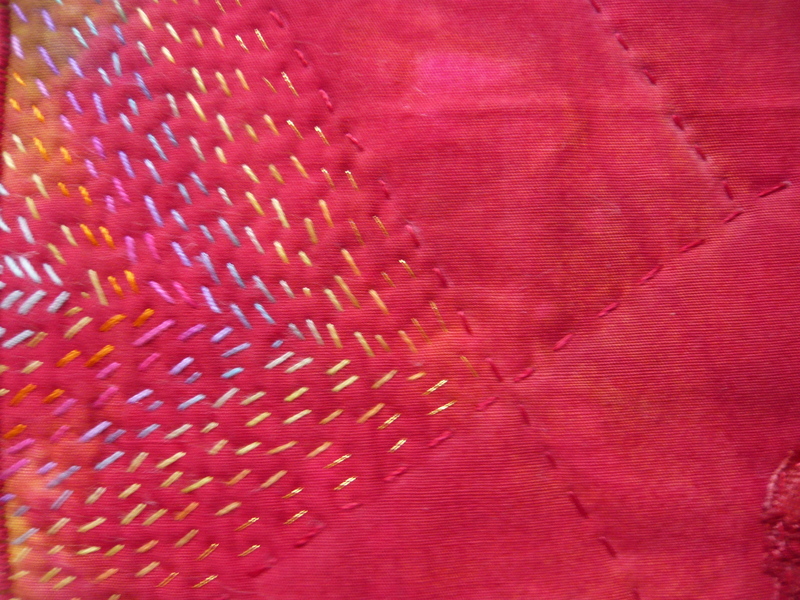 I then added Kantha stitching to the piece in the open areas. My intention here was to bring together the quilting techniques of East and West. Finally I added some sparkly ‘eastern’ embellishments and some subdued square ‘western’ embellishments, and I finished the piece edging the quilt with a row beads. Beautiful hand-stitching, Joan! 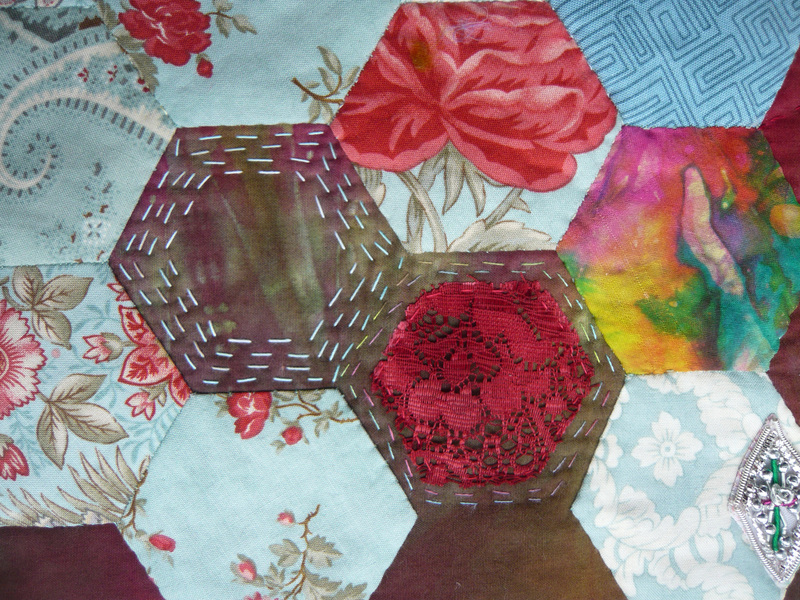 And isn’t it interesting how hexagons and English paper piecing have played through some of these pieces? Beautiful hand dyed fabric and hand stitching. The contrast between hand dyes and commercially printed fabrics works very well. Lovely, effective use of simple stitches and great colour choices. I’m a hexagons lover … and yours are really well organised ! the mix with hand dyed and commercial fabrics is very effective. Love the warmth of the colours and the mix with the stitching. Beautiful colors and diversity of stitching. Very innovative and beautifully executed. You used a lot of “differences” and it worked well together. Very nice! And all the beads around your quilt! must have taken hours. I love the way you thought about the theme, and the way you brought the two directions together. Beautiful colours and stitching makes it a very nice piece! You have certainly captured the theme, with the hexagons in more subdued fabrics, the bright red background to signify the East and finished with beautiful Kantha quilting. A well balanced design. Just love it Joan. I love the juxtaposition of techniques, fabrics, and embellishments. The kantha stitching pulls it all together. And the varying and unexpected embellishment is wonderful. A lovely piece! And now we see one thing that you’ve done with your hexies!